Capt. Steve Soule with a 37-inch winter marsh red caught on a MirrOlure She Pup. 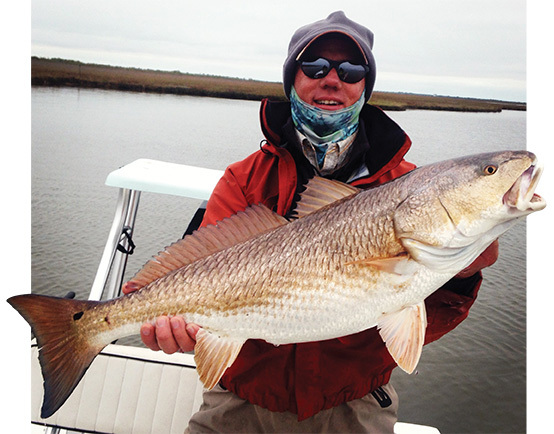 Winter weather has arrived on the upper Texas coast and so comes the arrival of some very different fishing. Colder air, colder water, reduced number of prey species and a different range of comfort zones dictate the location and feeding patterns of redfish and trout during the cooler months. Finding patterns that hold through winter will increase your fishing percentages, and of the long list of factors involved, I’ve consistently found a few that truly make a difference. 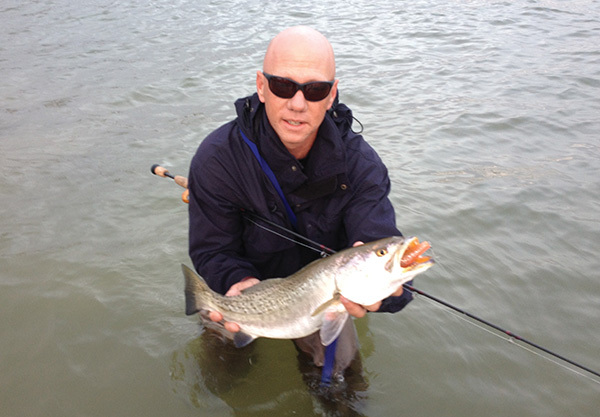 Mullet are largely on the menu for winter redfish and trout. First and foremost, in finding predatory fish in cold water is understanding the primary food sources that they feed upon. Most of the shrimp have either left the bays or will spend the majority of the winter buried in the mud. Crabs similarly disappear from the shallows, moving to deeper waters and also burying themselves in the mud. Many of the small species of bait fish will remain, though they won’t stay in water as shallow as they do in warmer months. There are numerous species of marine worms and other small creatures that remain in the bay, though we rarely see them other than when found inside the bellies of the fish we catch. So, the primary food sources for predatory fish are the remaining small baitfish, such as mullet, mud minnows and others that hang around the shallows. Finding fish during winter is isn’t always easy, but understanding the food sources makes a huge difference. 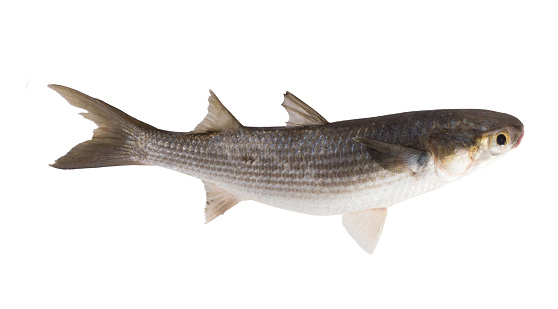 Mullet or other bait fish species that frequently swim at or near the surface and jump, are easy targets and help anglers in locating fish. This isn’t uncommon during warming trends. When water temperatures are colder or trending down, baitfish tend to stay closer to the bay bottom and move towards deeper, warmer water, making them much more difficult to locate. Much like every other season, native guides and even seasonal natives can shed some light on the location of the food sources and of course, the predators are usually close by. What I mean by native guides is birds. The birds that are good indicators are much different during winter than summer or fall. The gulls and terns that were such great indicators of migrating shrimp over the past few months are typically not the birds to follow or watch for during the cooler months. My focus changes to some larger birds and some that only arrive after significant cooling. 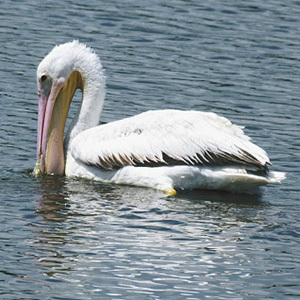 Both species of pelicans, brown and white, are voracious fish eaters and will often gang up when they locate large schools of mullet or other baitfish. And if you find large concentrations of bait in winter, odds are good that you will find predators as well. My favorite migratory bird to watch during winter is the Loon. This bird at a distance may look like the common cormorant, but when you get a little closer, its not hard to tell that they are much larger and have a large white patch on their chest. They also make a very distinct crying sound. They are incredibly adept diving birds that can swim fast and stay under water for several minutes. Finding more than one in an area diving is a great indication of schools of baitfish and predators. I’m always on alert for shore birds such as egrets, herons, and ibis, though you won’t typically see them along the banks feeding unless we have a good warming trend going. Winter is BIG trout time. Capt. Steve Soule caught this 27-inch trout on a Corky Fat Boy. Most fish and marine animals spend their lives following just a few things; food, comfort and safety from predators. Temperature plays a huge role in the location and movement of both bait and predatory fish during winter. Temperature effects the food species and their movements, which in turn effects the movements of their predators. Much like us, if it’s cold, they seek warmth, which is why they inhabit certain areas during cooler weather, yet their range can spread widely when water warms. A great basic rule to understand is that if water temperatures are falling, fish will tend to mover to deeper water and as water temperatures warm, they will return to shallows. Adding to that, this is driven by air temperature which takes time to impact the water. If temperatures are relatively stable, or the changes in temperature are not dramatic, the fish won’t feel the need to move as much as they will during more notable changes in temperature. There is an added important note, and one that we can feel and use to our advantage. As the air temperatures increase above the water temperatures, shallow water will warm fastest. As soon as this process begins, baitfish will begin to move to shallow, muddy and darker bottom areas. Another important pattern to remember is that tides will still move fish, and can also adjust the temperature of the water in specific areas. If the air is notably warmer than the water, outgoing tides will carry warmer water out to deeper areas. In colder conditions, the opposite is often the case; incoming tides can wash more stable water temperatures into the shallows. During the passage of winter fronts, especially those that have north or northwest winds, tides will fall sharply. The extreme low tides of winter tend to concentrate fish into very specific areas. In the marshes, the fish will fall into deeper creeks and bayous. In open water, guts, channels and soft mud near the edges of shallows will be the places to look. Once you’ve found the fish, keep in mind that they are primarily feeding on other small fish, so use lures that imitate mullet or other bait species. Note the temperatures and the direction they are trending, either up or down. Knowing this will help determine the speed of retrieves when fishing. Like any other time when fishing, it may take some experimenting to determine exactly where the fish are and what type of presentation will work best. The good news is that once you find fish in the winter, they are typically concentrated in good numbers. Also noteworthy, if you find bigger fish, you often won’t find the smaller fish mixed in, and vice versa. Braving the elements in winter is often rewarded with spectacular catches. Dress appropriately, take your safety and that of any passengers seriously. Dress in layers that can be removed or added as temperatures change, and get out and catch a few fish. When I first started fishing Galveston’s West Bay during the late 1970s, several fishing guides referred to it as one of the best kept secrets for winter fishing. Since then, the word has spread and today this body of water is a popular spot for late fall and winter fishing, especially by wade fishermen. From late October through much of the winter, wade fishermen score well on the big three, flounder, reds and trout. Upper West Bay in particular tends to be the favorite of anglers as opposed to Lower West Bay. Beginning in the vicinity of Jamaica Beach and running all the way to the Galveston Causeway, Upper West Bay holds numerous spots that are productive during colder weather. We will discuss some of the favorite places waders choose and talk about the baits and conditions that produce the best results. For starters, we need to mention that insulated waders are a must this time of year. Also, fishing with companions is highly recommended over fishing alone. While there are spots that anglers without boats or kayaks can fish, they are limited and the use of a boat to get you to the better spots is almost essential for increasing your odds for good results. Let’s start out by mentioning some of the spots that offer access to the bay for fishermen without boats. While actually across the line into Lower Galveston Bay, the shoreline from the Causeway Railroad Bridge down to Campbell’s Bayou is accessible by driving under the railroad bridge. You should plan on lots of walking if you fish this area. Carancahua Cove behind the Galveston Island State Park near Jamaica Beach is a popular spot and offers easy wade fishing. The flounder run will soon be in full stride on the Texas Coast. The Sportsman Road and Anderson Ways areas, just off of Eight Mile Road, are spots where wade fishermen can access the south shoreline of Upper West Bay. Starvation Cove is in the vicinity of this area and is quite popular. All of those spots are easily accessible by boat as well. For boaters, North and South Deer Islands and the surrounding areas are top spots for early morning wade fishing action. From Mecom’s Cut all the way to Green’s Cut, the spoil Islands offer great opportunities for taking all of the big three. On the north shoreline of Upper West Bay lays the spoil area beginning at Harborwalk and extending all the way to the entrance to Chocolate Bay in Lower West Bay. Off of Jamaica Beach is Shell Island that is covered by water at normal high tide; however, it is an excellent spot to fish for trout and reds. While it will be impossible to fish all of those spots on the same day, the variety is good. Live bait, especially shrimp and mullet, fished under popping corks is excellent; however, for waders it presents obstacles with the extra equipment needed to keep the bait alive. Artificial baits are by far the best choice as they are easy to carry, allow you to cover more territory faster and present a wider range of baits. Soft plastics are the top choice and the brand, color and style will depend on where you fish and the clarity of the water. Bass Assassins, Saltwater Assassins, Down South, Norton and corkies (Paul Brown Originals) are among the most popular soft plastic bait brands. Gold and silver spoons, along with a variety of Mirrolures, are used by a good number of waders. One category of artificial baits may surprise you as the top waters are used during the winter. Super Spooks, Super Spook Jrs. and Bombers are credited with some big trout during cold weather. Pre-sunrise and dusk are the times that they are most effective. The patterns of fish change as the water gets colder, with a shift to an afternoon bite rather than early morning taking place later in the winter months. Tidal movement continues to be important with high tide offering the best results for waders along the shorelines. When the water cools down, wrap up, put on your insulated waders and give West Bay a try. Fall is great time of year to try West Bay for a variety of species, trout included. 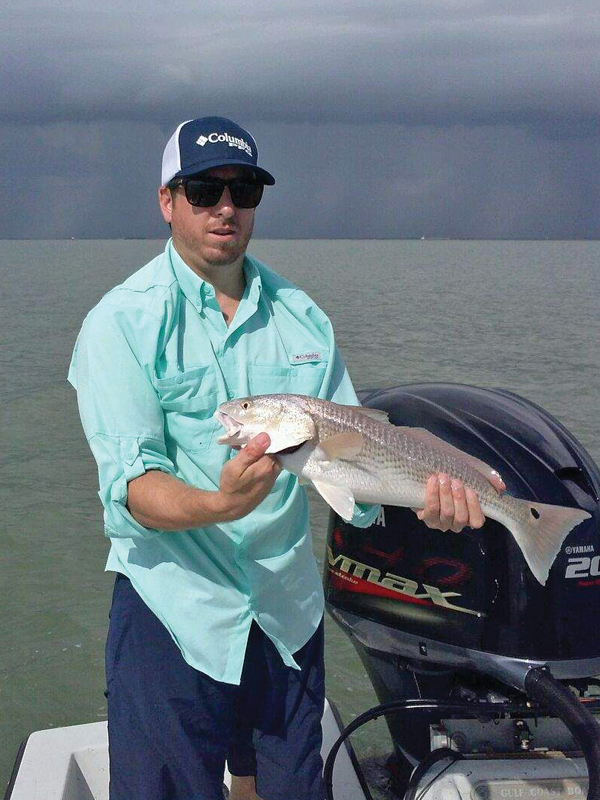 Mike DePol with the last redfish before the storm! Stepping outside with my cup of coffee, I was greeted by a deep chill in the air with the passage of a cold front. I hurried back inside the house to finish dressing, layering my clothing. I grabbed my wind and water resistant jacket, before I left on my way to the boat ramp. The five-mile boat ride was quite brutal. Once we got there, we spent the next few minutes rigging our rods and reels with some soft plastic lures. The next hour and a half provided little for our effort. With only a couple of speckled trout in the box, my customers gave me that, you got us out here for this? look. I looked at them and promised, “It’s fixing to get right,” as the tide began to move. I suggested that we move about a half mile away to a flat that has produced for me in the past during the winter. As I slowly idled into the area, I gave them a grin as a tint of off colored water appeared, along with a couple of Loons swimming and diving. The next four hours we caught fish. When it was all done our cooler was full of speckled trout and a few redfish. We also caught and released just as many! 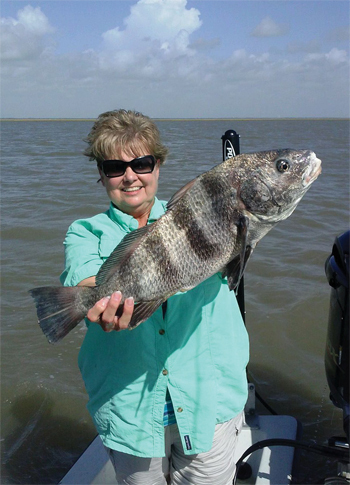 Ros Polumbo with a nice drum taken from Greens Lake. This scenario can be played out during January/February in West Bay. First, you need to dress for the weather. Layers of clothing provide the best warmth, in my opinion. The best part of layering is if you get too hot, you can always remove some. Furthermore, a good wind and water resistant jacket is a necessity. Stocking hats or even a full face mask are always useful to help keep you warm. Once your body gets cold, it’s hard to get warm again without heading to the dock and calling it a day. The winter area of West Bay that I mentioned earlier is what I call the triangle. Meacom’s Cut to Green’s Cut, then between North and South Deer Islands. During this time of year fish congregate in this area. It has a mixture of sand and shell, with depths ranging from three to six feet. The key to fishing this area is tidal movement. I usually do the best with an incoming tide. This area becomes crystal clear with cooler water temperatures. As the tide begins to move, streaks of off colored water will appear. This provides cover for the fish to ambush whatever unsuspecting bait that is there. You might only see one or two mullet flicker on the water surface. If you see a bird known as a “Loon” in the area, it’s a good bet baitfish are there. Drift fishing is the best way to cover the area and located the fish. Artificial lures this time of year work the best. Soft plastics or even swim type imitation mullet baits are best. I mostly use soft plastic type baits. The Norton Sand Eel or Bass Assassin are my go to lures during the winter rigged on a 1/8 ounce lead head jig. I find that a reel with a retrieve of 5:1 helps when trying to slow your presentation of the bait. Keeping your lure in the “strike zone” just a little longer is the key to having a successful day. My favorite color is black with a chartreuse tail. Just because it is cold, does not mean you can’t have a great day on the water. Dressing properly and fishing the tides is the key to a great day on the water. Fishing a couple days after the passage of a cold front can yield you a box full of fish! Don’t forget to like Coastal Charter Club on Facebook.